Several years ago I taught a workshop at the Boston Building Materials Coop (now Boston Building Resources) on residential exterior trim work. I don’t remember all the details of what I said, but I emphasized the importance of using materials that would survive exposure to New England weather without rotting. The villain of my story was the fast-grown #2 pine that is available cheaply (and temptingly) at many lumber yards along with the uninformed or unscrupulous carpenters who install it. I claimed that it rarely lasted more than 10 years without succumbing to fungi and other critters. It turned out that I was ruining the day of one of the workshop participants. Hundreds of feet of the pine in question had been installed on his house 2 or 3 years earlier, and my prediction made him a bit uncomfortable. He took my card, hoping not to call me. The problem with the commonly available pine in today’s lumber yards and home centers is two-fold: reality and expectations. The majority of the houses in New England that were built in the 18th and 19th centuries sported Eastern white pine trim, and today, many of those trim boards are weathered but still sound. This leads many carpenters to the not-unreasonable belief that EW pine is the right species for the job. Furthermore, all of that old trim is painted on the outer face, but the backs and ends of the boards are raw wood. The trouble arises because the pine available today, while technically the same species, is a very different creature. 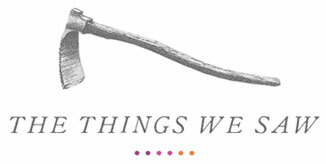 The original pine trim was cut from old-growth pine logs sawn from trees that had grown slowly over hundreds of years. Under those conditions, the trees synthesized their own fungicides and pesticides, allowing them to survive for centuries in a forest full of hungry tree-eaters. Today’s plantation-grown pine trees grow so fast, under such ideal conditions, that they never need to produce the protective chemicals –called extractives– that made old-growth white pine so magical. Compounding the problem, some contemporary carpenters take their painting cues from the craftsmen of yore. 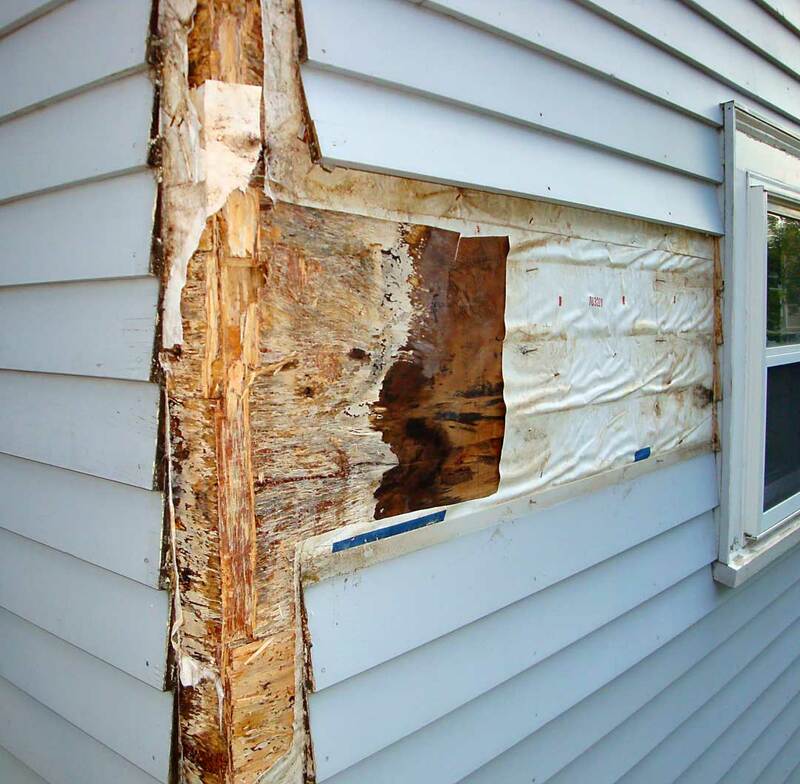 Current best practices require that all exterior wood, both trim and siding, be sealed with primer on all sides. 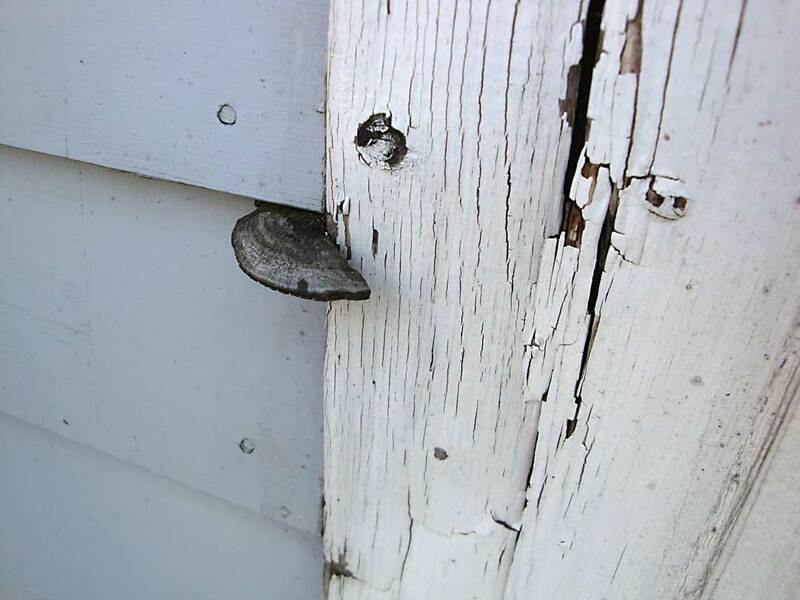 This goes a long way toward preventing the absorption of water, and dry wood is usually unappealing to bugs and mushrooms. “But they never primed the back of the boards in the old days!” complains the tailgate historian. If we were using the same materials (and felt confident in an infinite supply), we could play by the same rules, but today’s stock and sensibilities both beg for a greater prudence. The edges of the clapboards (western red cedar and usually fairly rot-resistant) were unpainted. Like the pine cornerboards, they seemed like they were chronically wet and had started to develop fungal decay. And perhaps most troubling, we found that the building barrier wrap, Tyvek in this case, had failed, allowing a great deal of moisture into the sidewall. The Tyvek seemed to be intact when we removed the cornerboard (we made the tear shown in the photo above). Tyvek is a material that makes me nervous, because its successful use is predicated on perfect construction practices. The problems with plastic building wraps like Tyvek are inextricably linked to their benefits. They are engineered to be impermeable to liquid water and to allow the slow passage of water vapor. In an ideal world, this makes lots of sense, as the building wrap will repel any liquid water that gets behind the siding but allow water vapor from inside the house to escape. However, if the plastic building wrap is breached (or installed with the wrong overlap orientation), liquid water that gets behind it can become trapped. 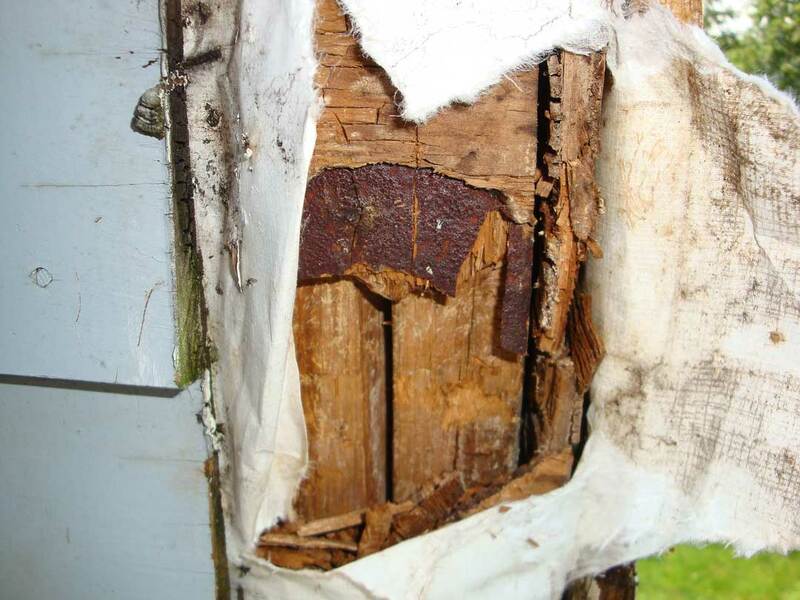 (1) This is what we believe led to the sheathing rot at Tom’s house. 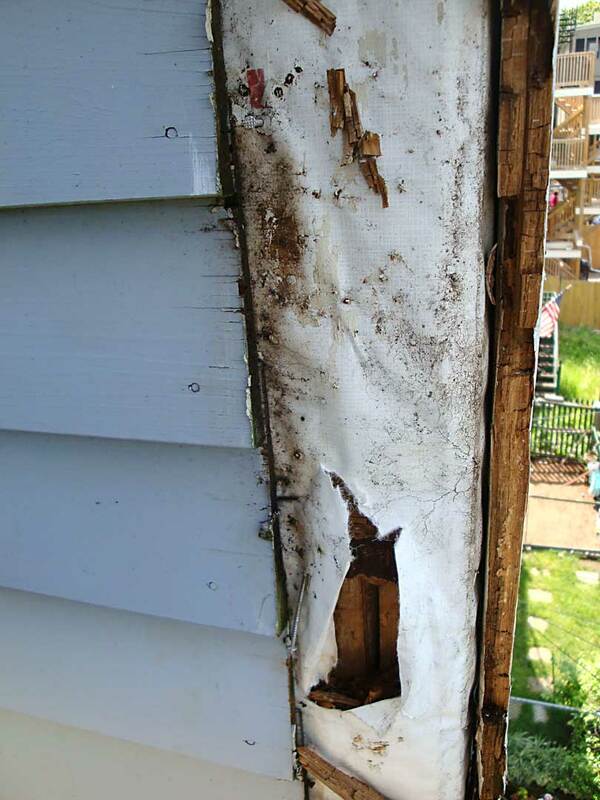 Anywhere we removed siding, we replaced the plastic building wrap with 15# felt (paper saturated with ashpalt). In our view, felt building paper offers a couple of critical advantages over plastic building wraps. First, it is not water impermeable. It can slowly absorb water from its wet side and allow it to evaporate to the dry side. This is a critical insurance policy is something goes wrong. Another desirable characteristic of felt paper is that its permeability to water vapor is variable, becoming more permeable as relative humidity rises. When a building gets wet, it is most able to help it dry quickly. We used spanish cedar, a naturally rot-resistant species, for all the exterior trim. We religiously primed all sides of the wood components we installed, including clapboards and trim. In locations that seemed destined to stay wet, we sealed the end-grain of any wood we installed with epoxy, giving further protection from moisture. While we are delighted to have many repeat clients, we strive to ensure that our subsequent projects don’t involve work we’ve already completed. (1) Housewraps, Felt Paper, and Weather Penetration Barriers, published online by the University of Massachusetts Building and Construction Technology program. I’m not clear on that from your article. The Tyvek in the picture appears to be lapped correctly, although not taped. Could the moisture in the walls be from condensed moisture carried by air leaks from the inside? Certainly it wasn’t evaporating fast enough to prevent rot!